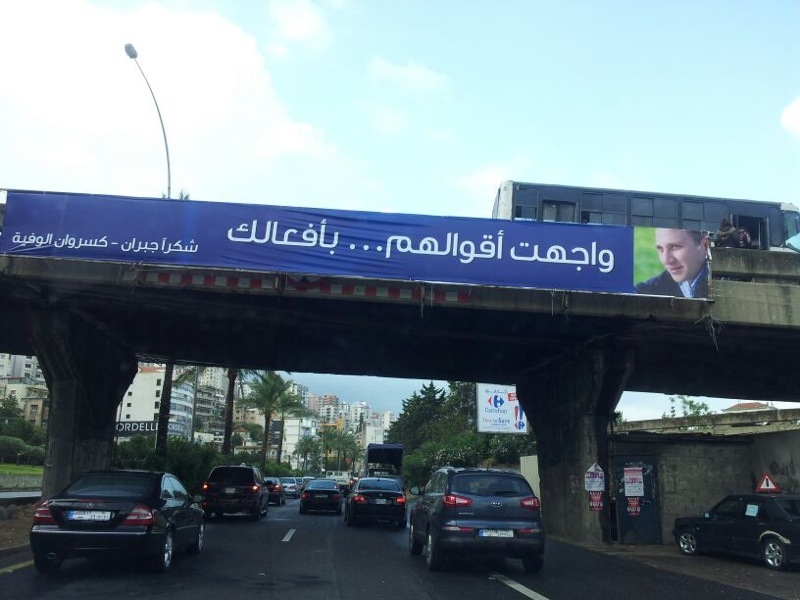 This entry was posted in Elections 2013, Lebanon and tagged Batroun, Elections, Gebran Bassil, Keserwan, Lebanon. Bookmark the permalink. We’re Proud of you Gebran!! Haha let him stay in Batroun please! He’ll settle down somewhere soon. You guys like big signs. I don’t read Arabic script, but I’m guessing the ads say the nuclear-powered maglev train is pretty much finished? (In all seriousness, I translated them – check the bolded part). Ads are not regulated here at all. The entire highway is actually filled with them. It doesn’t work if you only have a sporadic one here and there because the onslaught of others is too visually saturating. Around election time 4 years ago, the highway was divided equally between both factions. Posters everywhere, billboards, different slogans, etc… And it’s permitted although most of the billboards should not even exist legally but they do.